Stock Market Investment is easy and challenging. 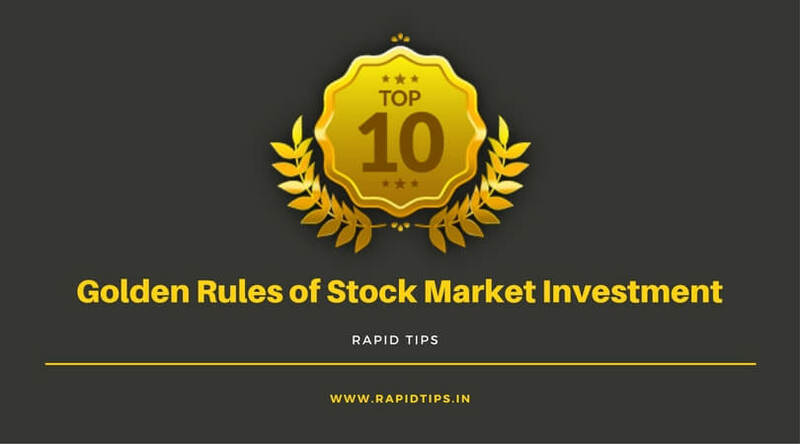 Stock Market Investment is a runaway If you know the rules of the game. Investors can make money In Stock Market. In this Stock Market Investors learn from their mistakes and graduate to the smart investor. In this rule fear and greed factor play very imp role. To avoid any future shocks, you should hedge your risk when you never invest in a Single Stock. The security dispute to this style of stock market investment is better to invest in mutual fund. In stock market stock selection is the critical factor which decides the return of your portfolio. When you have selected the stocks for investment, you must decide whether it is the right time for investing in that stock. Even if the stock is looking good and seems to have a good potential, it might incur your losses if you do not determine the optimum price level for investing in the stock. For this, you must technically analyze the price movement of the stock and determine the right price level when you should buy and sell the stock. If you’re interested in stock market basics, here are some guidelines to know. · The stock must be actively traded. · The liquidity requirements level become distracting for most traders in that you should stick to tickers with a price. If you lose money on something and cannot explain why then you will be angry with yourself. Always do your own research and stick to what you know. So, invest in a business you understand. Never invest in a stock. Invest in a business instead. And Never invest in something you do not understand. In the stock market, you would use your judgment to decide what is good value, and the same discipline must apply to financial investments. In the stock market whether a valuation is cheap, expensive or about right the several simple metrics, in the context of growth, risk, and quality, will help you to decide. In the stock market, this rule is the key to success. Selection of the stocks for investment means picking up the right stock. In the future at the stock market, the picking up right stock is most likely to appreciate. There are different types of stocks and it shows a different price movement. As an investor, you must decide which type of stock you are going to invest. In the stock market due to fear, greed, and investors inability to control emotions many investors have lost money. In a bull market, quick wealth is difficult to resist. When investors hear stories of fabulous returns made in the stock market in a short period of time. This leads them to take the risk without really understanding the risks involved they buy shares of unknown companies. In a bear market, investors are afraid and sell their shares at low prices. Therefore, when investing in stock market fear and greed are the worst emotions to feel. Before investing in stock market proper research should always be undertaken. But it is rarely done. Investors normally invest by the name of a company or industry they belong to. This is not the right way of putting one’s money into the stock market. By the market sentiments and the sudden news results in stock selling never get swayed. In fact, at that time when everybody is selling you should be buying. It is the time when you should have cash. Every fall should be a buying opportunity for you. It is a tough thing to do but once you achieve it you will make huge amounts of money in the market. That way you lower your cost of holding and gain huge percentages when the market is increased. Then you can sell at the higher prices and you will have cash when the market is in a downturn as opposed to your money being locked in the shares.